Weigh the Pros and Cons: Are There Collagen Side Effects? Have you been wondering if supplementing collagen is right for you? You’ve probably heard of at least some of the health benefits of collagen. It’s been touted as a gut healer, a cellulite smoother, a skin remedy, and a reliever of joint pain. But which of these claims are backed by science? Are there any reasons to avoid collagen that you might not be thinking of? What about the side effects? Are there any? If so, how bad are they, and are they worth it for all the potential benefits? There’s so much information to wade through, so we’ve laid out the pros and cons of taking collagen. We’ve researched and explained all of the health benefits, in addition to outlining the potential pitfalls and side effects that you might not be aware of. Collagen is the most abundant protein in both land and sea animals (including humans), and is located most densely in connective tissue (tendons, ligaments, joints, skin), although it’s present in muscle as well. 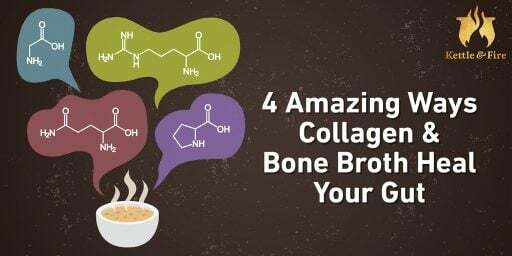 When bones are cooked at a low temperature for a long period of time, collagen is extracted from the bones and liquified into the broth that results. You know your broth is rich in collagen when it gelatinizes in the refrigerator. Collagen is also available in a powdered form to be added to smoothies, soups, sauces, or even just a glass of juice. If you’re looking to add your collagen to a cold beverage or food (like yogurt), make sure you choose hydrolyzed collagen (also known as collagen hydrolysate), as it’s been processed so that it doesn’t gel when it comes into contact with cold liquids. Collagen helps in the body’s natural wound care abilities, is critical in the reducing bone fractures and osteoarthritis, and has even been shown to reduce blood sugar response in patients with Type 2 diabetes (1, 2). When used as a dietary supplement, it’s been shown in clinical studies to reduce the appearance of fine lines and wrinkles, and improve skin elasticity and skin dryness (3). Claims that relate to this, which aren’t substantiated by scientific evidence (only anecdotal), are that it smooths out the bumpy appearance of cellulite and aids weight loss. In addition to more surface remedies, the amino acids found in collagen also offers a solution to leaky gut syndrome, healing and sealing an inflamed and leaky gut. When the gut wall is sealed and inflammation reduced, this helps protect the good bacteria living in the large intestine, which leads to long-term support of a healthy immune system and overall gut health (4). Studies have also shown that increasing collagen intake helps reduce physical activity-related joint pain by boosting the body’s collagen stores and lubricating the joints. Most people associate calcium supplements with bone support, but in truth, calcium is a brittle mineral. It’s the combination of calcium and collagen that truly improves bone health (5). When it comes to understanding the side effects of collagen supplements, it’s important to know which questions to ask. Side effects can range from very minor – a bad taste in the mouth – to extremely severe. Severe reactions are due entirely to allergic reactions from the original source of the collagen. Shellfish and eggs – two potential sources of collagen – are two of the eight most dangerous food allergies (6). If you have an egg, fish, or shellfish allergy, it’s critical to ensure that your collagen is not sourced from these. Always find out where your collagen comes from. You might also consider high quality bone broth to source your collagen, in which case, you’ll know exactly what’s in it. If the collagen powder you’re considering doesn’t have clear sourcing information on the packaging, choose a different brand. The potential benefits of collagen definitely don’t outweigh the risk of anaphylaxis. Other collagen side effects include upset stomach, feelings of fullness, heartburn, and a lingering bad taste in the mouth (2). If you’re experiencing these side effects, stop taking collagen until the symptoms have subsided. If you’d like to try again, begin with small amounts to allow your body to acclimate. Then you can slowly work your way up to a meaningful dose. Now that you know the facts about collagen products, you can decide if the good outweighs the bad. If you do decide to add extra collagen into your diet, be sure you’re using products from known collagen sources to avoid any major issues if you have severe food allergies. 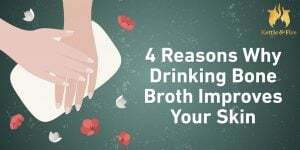 Use only collagen supplements from reputable brands, or make or purchase high quality bone broth to ensure that you’re consuming high-quality collagen proteins.